Till 2 Nov 2016 Watsons: Redeem Up to $20 Takashimaya Vouchers when You Purchase Products from P&G Brands such as Gillette, Whisper, Tampax, Clairol, Swisse & More! 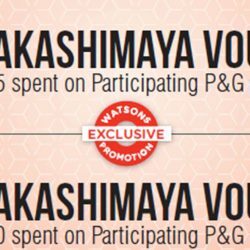 Redeem $10 Takashimaya Voucher when you spend $35 or $20 Takashimaya Vouchers when you spend $60 in a single receipt on participating P&G brands in Watsons Singapore! Promotion period will end on 2nd Nov 2016. Promotion is valid while stocks last.